Biologic medications have been making headlines as innovative therapies for the toughest diseases, and numerous brand names of these drugs are now available to treat complex conditions like rheumatoid arthritis (Humira® and Enbrel®), multiple sclerosis (Avonex® and Tysabri®) and cancer (Herceptin® and Avasin®). However, these specialty medications are also being talked about for their huge price tags. Biosimilars offer competition and often a less expensive alternative to the high-cost branded originator products, but while they have been available in other countries for the last decade, the U.S. has only recently approved a handful of these drugs. Aside from FDA clearance and legal battles between manufacturers, many hurdles remain before payers and patients can realize the full benefits of biosimilars, including determining how and if to incorporate these alternative treatments into formularies. That’s why it’s important to first understand what biosimilars are and how they work. Essentially, there are two types of medicines: small and large molecule formulations. Small molecule medicines are what we would consider traditional drugs, such as Lipitor®, ciprofloxacin and aspirin. A chemically synthesized, consistent process is used to produce these medications. Large molecule, or biologic drugs are often derived from living cells and are more complex and variable in design, harder to engineer, and often require special handling. To help demonstrate the difference, the two medication types can be compared to Legos®; traditional, small molecule medications are like the action figures made up of 10 to 15 pieces that are easily put together without any instructions. Biologics on the other hand, are like the Star Wars Millennium Falcon kit with over 5,000 pieces that requires directions and is much more complex to create. Because of that, biologic drugs are more expensive. In fact, the average price of a biologic drug can be as much as 70 times more than that of a non-biologic medication. Small molecule brand medications have lower-priced alternatives that we know as generics. Because the original, small molecule brand drug is chemically engineered, patients can be assured that the generic is an exact chemical copy, and the clinical results will be the same. Biologic medications, however, are created from living organisms and their structure and clinical performance depend on the means of production. While, an exact duplicate of the original product isn’t possible, biosimilars are biologics that are highly similar to an already approved biologic. To be approved by the FDA, biosimilars cannot have any clinically meaningful difference from the originator product in terms of safety, purity and potency, however, when ‘reverse engineering’ to make a biosimilar, the result will produce a slightly different drug. Biosimilars cost significantly less than the originator drugs and have the potential to save over $110 billion in the U.S. and Europe by 2020, especially as patents expire. This is because the manufacturers of biosimilars benefit from existing scientific knowledge about the safety and effectiveness of the reference product, saving time and resources in their development, which results in lower costs. From a price perspective, biosimilars are estimated to cost 10-15% less than their orginators—far different from the average generic that is 60% less expensive than its brand equivalent. However, with the high cost of individual prescriptions for specialty medications, even a 10% price break equates to thousands of dollars per patient. In the U.S., there are 45 biosimilar products in late-stage development and 18 are currently approved, but only a handful have actually been launched into the market. This is because the original manufacturers are aggressively protecting their patents with litigation, and regulatory issues have restricted availability of approved biosimilars. Another hurdle that biosimilars face is acceptance. Research shows that patients have little understanding of the distinction between biosimilars and the originator biologic, except for the price. Patients may have a number of fears about switching to a biosimilar treatment. It may require a different administration, such as a different type of auto-injector or syringe, which can cause confusion or frustration. There could be different storage requirements, or there could simply be a loyalty to the branded originator they are using due to marketing tactics or the success they’ve had, as well as anxiety over how the new drug will perform. Not surprisingly, patients look to their doctor for guidance, as proven in a study where 73% of patients chose a biosimilar over the biologic drug because of their doctor’s recommendation. 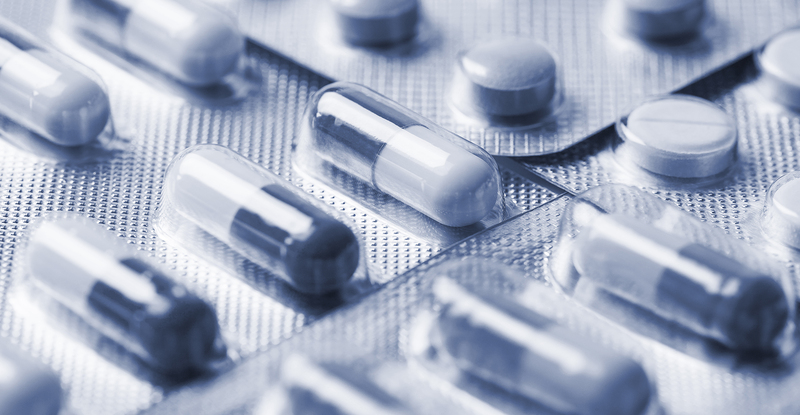 However, some doctors are hesitant to prescribe biosimilars due to their lack of clinical experience with these new drugs and uncertainty of the quality. This is partly because the long-term effectiveness is unknown and any negative effects might not be seen for several years. Yet, physicians also understand the costly nature of specialty medications. Clinical concerns aside, another study showed that doctors were willing to recommend biosimilars if there was at least a 40% price difference. For payers to realize the full potential for savings and improved health outcomes, a thoughtful approach to biosimilars is needed. Since biosimilars are specialty medications, EnvisionRx employs several strategies in our SpecialtyCare model, which leverages condition-focused clinical controls, individualized care, true integration with the specialty pharmacy, and the application of meaningful data. Clinical Effectiveness: Our Pharmacy & Therapeutics (P&T) committee, consisting of independent, external clinicians, evaluates the clinical effectiveness and therapeutic efficacy of the biosimilar, providing recommendations for utilization management and formulary placement. Economic Impact: For those biosimilars that demonstrate sound, similar clinical performance, careful consideration is given on pricing controls as we negotiate the best cost with manufacturers and determine tier placement. Member Disruption: We establish proper step therapies for patients new to treatment, while at the same time, allowing existing patients at stable state to choose to continue use of the original, brand medication, grandfathering the drug to limit member disruption. EnvisionSpecialty then helps patients convert to biosimilars, discussing the medication with the patient, educating them on the product, its administration and storage, and helping to ease any fears or concerns. This helps the patient make a smooth transition that will save them and the plan money, while providing optimal health outcomes. EnvisionSpecialty pharmacists also educate prescribers, informing them when biosimilars are an acceptable, cost-saving alternative. EnvisionRx currently requires step therapy for many brand originator products for which biosimilars are available, having patients try the biosimilar before progressing to the more expensive brand originator product. We will continue to reevaluate our formulary strategy every time another biosimilar product is approved, monitoring the drug pipeline and updating our clients. Biologics, including biosimilars, are changing the pharmaceutical landscape with new treatments that are positively impacting the lives of millions. As more specialty medications come to market, we will continue to protect our plan sponsors and patients by providing a pharmacy care experience that offers better access to treatments and improved outcomes. Kopenski, F. & Holcomb, K. (2015). 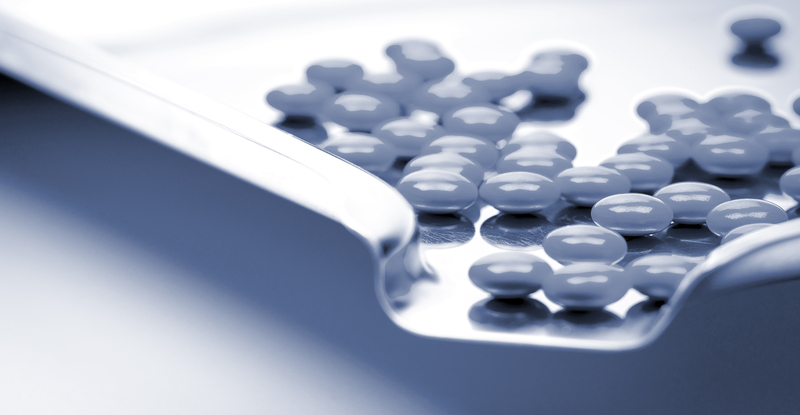 Understanding Biosimilars and Projecting Cost Savings to Employers – Update. Milliman, Inc. June 29, 2015. Braido, F., Holgate, S., Canonica, G.W. (2012). From blockbusters to biosimilars: An opportunity for patient, medical specialists and health care providers. Pulmonary Pharmacology & Therapeutics 25 (2012) 483-486. Costill, D. (2016). Understanding the challenges facing biosimilars. First Report Managed Care, December 2016, p. 8. 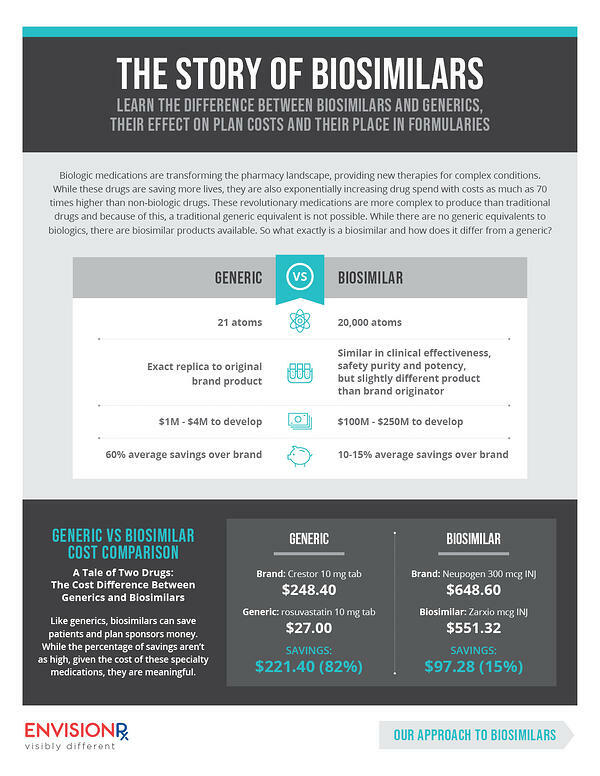 Download our infographic to learn the differences between biosimilars and generics, their effect on plan costs and their place in formularies.